I’ve never really been happy with how I do morning work or you might call it bell ringers. From the moment my kids walked in they were immediately in school mode. Read this, solve that, get behind before your day has actually begun. So, I started changing my ways. Last year, in my fifth grade class, my morning work consisted of my kids logging into Google Classroom and responding to that day’s estimation activity from estimation180.com. They really did like it, and it didn’t feel like work. Plus, their estimation skills did improve. Then, they could choose from our Lego bins, read, or write. With the Lego bins they could free build or try one of the challenge cards. It worked pretty well. Then, I decided to move to first grade. Moving to a new grade is really making me take a closer to look at my morning work routine. I want my kids excited to get to school, to build something, and to talk and collaborate with their friends. I did not want worksheets. So, I began looking at Pinterest, talking and sharing with other teachers at nErdCampKS and EdCampKs. Many of those teachers then told me I needed to join the Facebook Group Primary Morning Tubs. With all of those resources I began gathering supplies. Before I share the actual tubs I do want to mention my overall philosophy about the tubs. This isn’t graded work. It won’t require a worksheet to be filled out. There must be choice within the tubs. Talk, collaboration, and fun are the goals! Lego Tubs-I already had Legos so that was an easy tub to begin with, and I had the challenge cards. There are great STEM ones you can purchase if you search on Teachers Pay Teachers. I found free ones here and here. If you just search Lego Challenge Cards on the internet, you’ll find even more. Geoboards-Found out I had these as well. Kids will have fun creating all sorts of designs. I found the task cards here and they also have a recording sheet if you wanted to go that route. Again, just do a Google or Pinterest search and you’ll find tons. Tangrams-I think I have sets of these in my classroom or at least in my building. However, this website had printable cards and printable tangrams. Click here for more cards that have the alphabet, and I think numbers as well. I’ll probably add to my cards as I go. Again, just do a Google or Pinterest search and you’ll find tons. Pattern Blocks-So excited when I found out I had a tub of these. I found various activities for this one. Kids can create composite shapes, numbers, alphabet, patterns and more. If you don’t have pattern blocks, click here for a printable set. 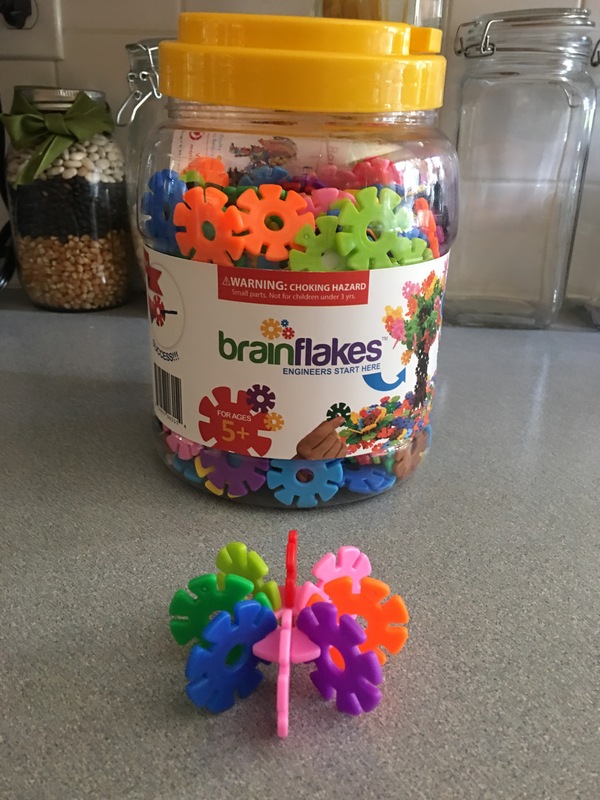 Brain Flakes-I was so excited to win these at EdCampKS in Andover, Kansas last month. I do not have task cards for these. I’m thinking about making some, just not sure what to do just yet. Click here to order. I’m not affiliated with them, so the link is just to help you find them quicker. Of course, you could also find them on Amazon. Play Dough-Ok, there are just so many things you can do with Playdough. Kids can shape it, stamp it, cut it, make models and more. Click here for the shape cards in the picture and then here for activity mats I found. I haven’t printed them yet as I seem to be going through a lot of ink lately. Need to get a new printer that has the insta ink program. Unifix Cubes-Yes! Another great find in my new classroom. Unifix Cubes are just plain fun to build with and make your own patterns or designs. I did find two great task cards here and here to offer the child who just wants a little more structure or direction. So how do these tubs work and how will I manage them? Good questions I’d say. Now remember, it’s the summer and I’ve never taught first grade. So, this is really how I think I will do things and hope to post a follow up in August or September. Begin with the manipulatives and supplies you already have. There’s really no need to go buy anything fancy. Find free task cards on Pinterest or Teachers Pay Teachers. Click here for my Pinterest board. I’d suggest laminating as many hands will be touching them and you can clean them easily if laminated. Repurpose your existing containers or if you really have to have things look the same, invest in containers. Just be sure the kids can easily open them. Decide how you will store the containers. My kids have desks arranged in groups. Each group will get one bin to share. This is where collaboration and talk come into play. Also, it’s a great opportunity to work on social skills. I will set the bins out on their desk groups before I go home. While it would be easier to let them help me, I want them wondering and anticipating which bin they will get the next day. How often they get a certain tub will depend on how many tubs I have to offer. Once they have checked in for the day (lunch count and attendance), they are free to work on tubs until Morning Announcements and the start of our first subject. This may only be twenty minutes at most. Within most tubs there are challenge or task cards. These are used by students only if they choose to do so. Some kids love to just freely explore. Others really do want structure and challenges to meet. Have students record what they made. I’ll discuss this in another section. Once students have created something with the Morning Tubs, they’ll want to share it. You can use this as a way to show parents and administrators what the kids are doing, as well as teach digital citizenship. I’m planning to use these apps to have my kids post what they’ve created, explain what they’ve created, and provide constructive feedback to peers. Of course we won’t use them all at once, or even right away. This will help with speaking and listening skills, as well as how to use social media responsibly. Below are a few of the apps I’m thinking of using right now. Some closing thoughts. I’m finding more ideas than I have space or tubs for right now. 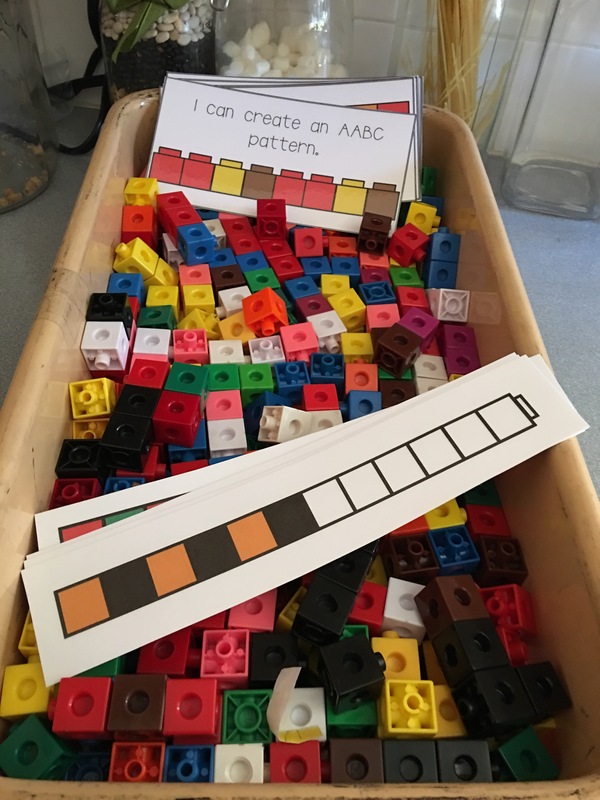 Click the links to see ideas on using rocks, cardboard tubes, and making patterns. I’m thinking of changing out the types of tubs I offer by the quarter so that each quarter there is something new. I just don’t want this to become boring. I do have a marble run that I will introduce later in the year once they are used to the routine. Just not sure if I want to begin with that one. What are your thoughts on that? Ready to ditch the worksheet or computer program in the morning? Do it! Take the plunge with morning tubs. Hopefully you’ve found some ideas here, but don’t forget that Pinterest and the Internet are great places to find free resources and ideas. And hey, while your’e at it, head on over to Facebook and join the Primary Morning Tubs group. You’ll meet a lot of great teachers willing to share ideas and learn from one another. Please post a comment on how you use or plan to use Morning Tubs. I’m so glad you found the ideas helpful. Thank you for taking the time to leave me a kind comment. Thanks for sharing! I’m going to try this in my classroom in Auckland, New Zealand this term. I have a mixed age class so this will be perfect. You’re welcome, and I’m so glad you found it helpful. I started using morning tubs in my first grade classroom this year as well. I love that my students start their day on a positive and engaging note. I also love the collaboration that it encourages. I use similiar morning tubs to yours, but I also add some art related things (sometimes this is just free drawing or using pastels or some other fun art supply) and traditional games that some students don’t know how to play (i.e. connect four, go fish, puzzles). I like the idea of art and traditional games. To me it’s all about starting off their day in a positive way. I love this time of the day.